How did our ancestors celebrate Christmas? 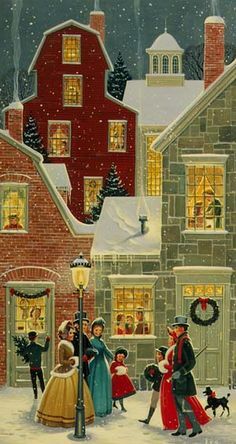 With Christmas fast approaching (you may even be reading this after all the festivities are over), have you ever wondered how our ancestors celebrated Christmas? We all have festive traditions we enjoy at Christmas such as a roast turkey with all the trimmings, carols at church on Christmas Eve and a Christmas tree with fairy lights but how long have these traditions been around? For our medieval ancestors, Christmas was an important religious festival. During the 12 days of Christmas, churches and other buildings were decorated with evergreens including rosemary, holly and ivy. Christmas boxes were distributed to servants and the poor whilst large amounts of brawn, roast beef, “plum pottage”, minced pies (made from meat) and ale were consumed. People celebrated by dancing, singing, playing games and performing stage plays. This came to an abrupt end during Oliver Cromwell’s Puritan Commonwealth in the 1640s where the drunkenness and revelry associated with Christmas was condemned and Parliament banned the celebration of Christmas in 1647, replacing it with a day of fasting. Under Charles II Christmas festivities were restored but traditions remained largely unchanged until the Victorian period. Christmas trees had been popular in Germany for centuries but it was only following Queen Victoria’s marriage to her German husband Prince Albert in 1840 that some of the German traditions were introduced here. An engraving of the Royal Family celebrating Christmas at Windsor Castle in front of a decorated Christmas tree was published in 1848 and the idea quickly caught on although initially they only tended to be displayed in public buildings. From the 1860s the Bucks Herald reported that some local schools had Christmas trees with small presents as a treat for the children whilst trees were also provided by benefactors to the hospital and workhouse in Aylesbury. Christmas cards are replaced to some extent now by electronic messages but they were first introduced in 1843 by Sir Henry Cole, a civil servant who helped set up the new Post Office and thought it would be a good way for ordinary people to use the service. They gradually became popular, especially from the 1870s when the cost of sending Christmas cards by post was reduced. Most people now have turkey on Christmas day but again they only became popular in the Victorian period, replacing the previous favourite of roast beef. Market traders in the local towns sold turkey from the 1860s whilst the local Aylesbury duck was obviously popular too. Historically celebrations were centred around the church but by the later Victorian period other events such as Boxing Day hunts, brass band parades and pantomimes regularly took place. Christmas festivities now seem to start much earlier but originally workers only had Christmas Day off. Over time employers also gave their servants small gifts and the day off on Boxing Day, traditionally known as such as money collected for the poor in alms boxes would be opened on the day following Christmas Day. Some employers, notably the Rothschilds who in the later 1800s owned seven country houses and various estates in the Vale of Aylesbury treated their employees and local villagers to an annual Christmas party with food and entertainment – well received at a time when many people had little spare money to spend at Christmas. Times may have changed since then but many of the traditions we enjoy today have their roots in the Victorian period if not earlier. Merry Christmas! Most of us would have been taught at school that George Washington became the first president of the United States of America in 1789 but it’s not widely known that his great grandfather John Washington originated from Tring in Hertfordshire. Since the 1920s a Washington family tree has hung on the North wall of Tring’s Parish Church of St Peter & St Paul depicting those members of George Washington’s immediate ancestors who were born in Tring or associated with the town. In June 2015 as part of the Tring 700 celebrations a new, revised family tree of the Washington family was presented to the church by the Tring & District Local History & Museum Society. Recent research by Murray Neil, the author of “The Washingtons of Tring” showed that revisions to the original were required. His book recounts how John Washington’s father Lawrence was born in Sulgrave Manor, Northamptonshire in 1602. He entered Brasenose College, Oxford, in 1619 and was elected a fellow of the college in 1626. He was related to the Spencers of Althorp House and during his time at Oxford he visited Althorp on at least two occasions where he met Sir Richard Anderson who was married to Lawrence’s fourth cousin, Mary Spencer. Sir Richard was the owner of Pendley Manor in Tring and it was there that Lawrence met his future wife, Amphyllis Twigden, a farmer’s daughter from Creaton, Northamptonshire. Her mother had moved to Tring in 1612, after her husband died, with Amphyllis and her four sisters, havingmarried Andrew Knowling of Frogmore Street. When Lawrence and Amphyllis met at Pendley Manor they had an affair which resulted in the birth of their son, John, in 1631. They could not marry then as fellows of Oxford University were not permitted to marry. However after Lawrence was appointed as Rector of Purleigh in Essex they married in Tring. Two more children were born in Tring before Amphyllis and the children moved to Purleigh in 1637 where two daughters were born. Purleigh was a rich parish in an area that was predominately Puritan and Parliamentary whereas Rev. Lawrence was Royalist and Anglican. In 1643 after the start of the Civil War he was ousted from Purleigh due to his Royalist sympathies and became vicar of a poor church in Little Braxted, Essex where he remained in poverty until his death in 1653. Amphyillis and the children returned to Tring in 1641, where her final child, William, was born, and she remained in Tring for the rest of her life. In 1650 her stepfather, Andrew Knowling, died and left his estate to Lawrence, the second son of Rev.Lawrence and Amphyllis. As the eldest son John should have been the beneficiary of Knowling’s will but due to his illegitimacy he was denied his inheritance. If John had inherited Knowling’s estate then it is unlikely that he would have left Tring and therefor the history of the United States would have changed significantly. Amphyllis died in 1655 and was buried in the graveyard of Tring Parish church. John was in Tring in 1656 to finalise his mother’s affairs before leaving on a trading voyage to Virginia. On the return voyage his ship was wrecked in the Potomac River resulting in John remaining in Virginia. He married the daughter of a rich plantation owner and they began a family which eventually resulted in the birth of his great grandson, George Washington, first president of the United States of America. Murray’s book is available from Tring & District Local History Museum in Market Place, Brook Street, Tring (the museum which is well worth a visit is open from 10 am to 3.30 pm on Fridays and Saturdays) and also Almars in Tring High Street. Mention County Hall to any local Bucks person, and they will probably conjure up an image of the 1960s concrete tower block in Walton Street in Aylesbury which most people consider an eyesore. However this was not the first County Hall built in the town – that honour goes to the 18th century smaller but more imposing building at the bottom of the Market Square which is now the Crown Court. There had been rivalry between Aylesbury and Buckingham for a couple of centuries regarding which one should be considered the county town. Whilst Buckingham had originally been granted that status in the early medieval period and had obviously lent its name to the county, in practice since the Tudor period Aylesbury was regarded as the county town and the majority of the Assize Courts (predecessors of the Crown Court) were held in the town. In 1720 it was decided to rebuild the old gaol and court house in Aylesbury and 2 local architects submitted plans for a County Hall which were judged by John Vanbrugh the architect best known for designing Blenheim Palace and Castle Howard (a cheaper option than paying him to submit plans himself!). He chose a design by Thomas Harris of Cublington; it is not known if he accepted them without any modifications, although he almost certainly wouldn’t have designed a building himself with prominent drainpipes placed between the windows. Work commenced in 1722 with Thomas Harris as the builder but it was suspended for 13 years from 1724 due to lack of funds and political feuding (some things never change! ); the exterior of the building was finally completed in 1737 and the interior in 1740. Built in a classical Palladian style (after the Venetian Andrea Palladio), with some baroque features, it is one of the first examples of a Palladian building outside the capital. It was constructed in red brick with stone dressings with 7 bays, the middle 3 are crowned with a pediment decorated with 3 large stone urns. The far left ground floor window was originally the entrance to the gaol which was built behind the hall whilst the county emblem, the Buckingham swan in chains adorns the wrought iron over the central door. Unless called up for Jury Service, most people probably won’t see the interior of the building which contains a stately staircase and a grand panelled court room. This was destroyed by fire in 1970 but it was restored in every detail including box pews, a gallery and a raised judge’s seat. Both Assize Courts and the local Quarter Sessions courts were held at the County Hall and there were a number of notorious cases heard for crimes including murder and highway robbery. Especially in the 18th century, those found guilty were often sentenced to death including those charged with lesser crimes such as sheep stealing and wounding of deer. In the 19th century as attitudes began to change progressively fewer executions were carried out and convicts were often transported to Australia instead. Between 1810 and 1845 the handful of those convicts who were condemned to die without any reprieve were hung from a drop erected on a balcony below the upper middle window of the County Hall. The executions attracted huge crowds and the Bucks Herald estimated around 6000 ‘less respectable’ people, mainly from the villages crowded into the Market Square to watch the 1845 execution of John Tawell who had poisoned his mistress. Tawell had been transported to Australia in 1820 for forgery but having obtained his ticket of leave he trained as a chemist in Sydney and became very wealthy. Returning to England in 1831 he remarried after his first wife died but he continued to have a relationship with Sarah Hart/Lawrence a nurse to his family and set her up in a house in Slough. Facing financial problems he poisoned her and he tried to escape by train to London but he was apprehended as the Station Master at Slough had sent a telegraph to the police in London, alerting them that the suspect was on the train – the first occasion that the use of an electric telegraph had resulted in an arrest. By the 1840s conditions at the old prison at the rear of the County Hall were very poor and it was decided to build a new prison on the Bierton Road which was opened in 1847 (now the Young Offenders prison). As a result new Judge’s lodgings were constructed in 1849-50 at the back of County Hall to replace the old gaol. The new Buckinghamshire County Council established in 1888 following the new Local Government Act was also based in County Hall until the Old County Offices were built in Walton Street in the 1920s.